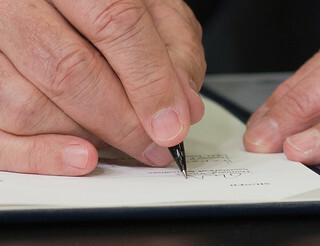 Agriculture Secretary Tom Vilsack signs a Memorandum of Understanding (MOU), during the Innovation Center For U.S. Dairy Sustainability Council Meeting, on Wednesday, Apr. 24, 2013, at the White House, Washington, D.C. The objectives of the MOU are to increase the construction of anaerobic digesters and explore innovative ways to use products previously considered waste streams from dairy production, processing and handling. USDA Photo by Lance Cheung.